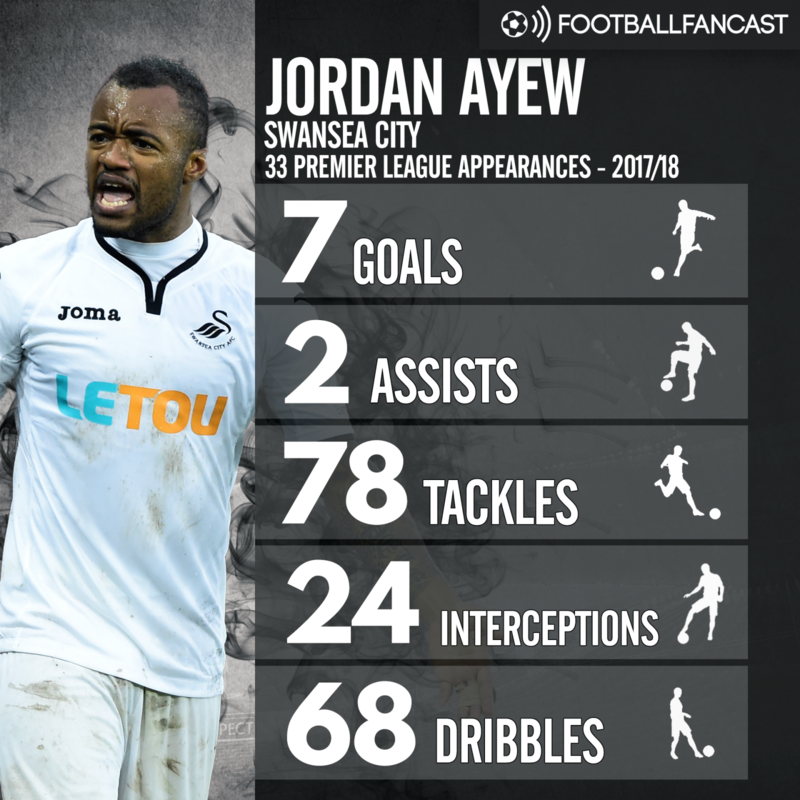 Football FanCast’s suggestion that Liverpool should complete a shock swoop for Swansea City striker Jordan Ayew certainly divided opinion. While the majority of those who took part in our poll sided with the idea, 52%, a rather significant minority of 48% didn’t. At first glance, that’s more than understandable; Ayew’s only two full seasons in the Premier League so far, after going down with Aston Villa in 2015/16, could end in relegation should Swansea fail to avoid the drop this term. Liverpool, in contrast, will want to make a push for the division’s summit next season and could even enter it as European champions. But sometimes fitting into a system is more important than actual ability – just look at seventh-placed Burnley – and for a couple of reasons, the 26-year-old appears well-suited to what Liverpool need. Perhaps the most obvious one is greater squad depth, particularly up front. With Daniel Sturridge’s Liverpool career dead in the water and Alex Oxlade-Chamberlain ruled out through injury, the Reds head into a Champions League final depending on Danny Ings and Dominic Solanke to make an impact from the bench, or potentially even to fill in for Mohamed Salah, Sadio Mane or Roberto Firmino should the worst happen before the meeting with Real Madrid in Kiev. Football FanCast have already discussed one way of improving Liverpool’s attacking depth, by signing an upgrade on Mane and using the Senegalese attacker as part of the squad rotation because he’s so versatile and capable of consistently making an impact from the bench. The alternative is, of course, signing players this summer with the intention of using them primarily as substitutes rather than a regular part of the starting XI. Ayew, who Transfermarkt value just at £6.3million and has spent his Premier League career battling relegation, would likely be more open to accepting that reduced role at Anfield compared to some of the big names on the Reds’ summer radar. The Ghana international can also operate anywhere across the front three, as he has already for Swansea this season, and while he’s not on Mane and Salah’s level in terms of natural talent, he’s of a largely similar mould – a versatile and nomadic forward favouring speed over height and power, who occupies spaces between those of a winger and a typical centre-forward, and has a comparatively decent eye for goal. Although his seven strikes this season isn’t a hugely inspiring total, it actually represents 26% of all Swansea’s Premier League goals, the Welsh side being the joint-lowest scorers and the lowest creators (sitting 47 chances behind the second lowest, Huddersfield) in the top flight for 2017/18. But there’s another aspect to Ayew’s game too, that could make him specifically such a smart signing for Liverpool. It feels strange to judge attacking players on tackles and interceptions but that’s part of the criteria that has earned Firmino such high praise during the last few campaigns, and the only forward to make more tackles than him in the Premier League this term is indeed the Swansea star with an average of over two per game. That’s not to say Ayew and Firmino are winning the ball back in the same way – whereas Liverpool press high, the Welsh side have spent much of the season sitting deep – but when combined with his natural athleticism and speed, the potential is certainly there for the African attacker to perform well in Jurgen Klopp’s system by making challenges in dangerous areas. Although relegation may be initially seen as an indicator of why Liverpool shouldn’t move for Ayew, it’s also why the Merseysiders may be able to pick him up on the cheap this summer – if they go down, Swansea will likely be forced to sell arguably their most talented player at something of a reduced cost. And for all those unconvinced about Liverpool swooping for someone who could technically be a Championship player by the time the transfer window officially opens, just look at how well signing Andrew Robertson’s worked out for the Anfield club. Ayew could quickly prove a likewise gem.